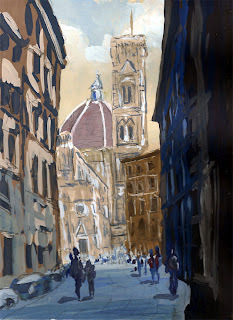 RoyTheArtist and Friends: Watercolour Goache painting of (venice) No Florence! Watercolour Goache painting of (venice) No Florence! This rapid colour sketch was done so I could make a video showing how SimmTrace can be used with opaque watercolour. You can overlay layers without worrying about drawing, as you can use SimmTrace to then place objects in your painting. I will post the video once edited. Thanks Cretox! What a muppet I am!